Ouch. Yesterday was a toughie. Glad it’s over and I have officially made it through that dreaded first year without my Mom. I need to shift my mood so I am going to share something positive. Remember how Full Speed had a choking-of-his-classmates phase? Unfortunately if you don’t, I do. No matter how much denial I throw at the memories, I still cringe at the thought of red-marks on little Jimmy’s neck (name changed to protect his identity). It got to a point if Full Speed received a yellow mark (just okay) for talking out of turn or not waiting in line properly, I wasn’t upset at this behavior but infinitely relieved that no bodily harm had come to any of his peers. Anyway, over the past two weeks, Full Speed has consistently gotten green marks for behavior (green is good). And, you could have knocked me over with a feather when I walked in his class, checked the behavior chart and saw he had a purple mark (above and beyond good, and, dare I say it, exceptional?) resting under his name. To celebrate I told him he could pick where we would have dinner the next day. 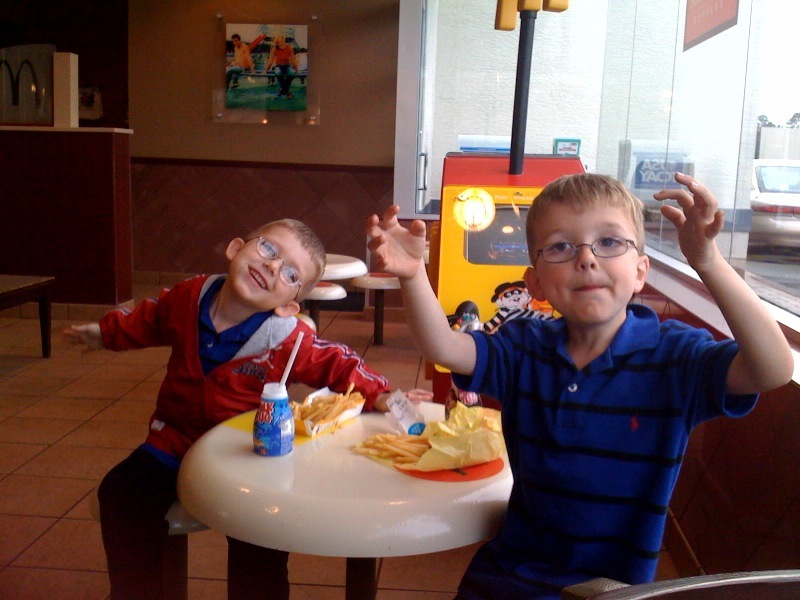 Like any red-blooded American boy he chose…., McDonald’s. So, the next day I have little T.Puzzle in tow and we head to pick up Full Speed for our fine-dining McDonald’s experience. We walk in the room and guess what? Full Speed had ANOTHER purple mark. I had to run it past his teacher to make sure it was legit and not an error in record-keeping . Turns out, it was a completely approved purple mark. Two purples in a row. Here’s hoping for another choke-free day (fingers crossed!). What dudes -Go moms, nice blog! omg this is a totally funny entry…not funny because of the choking thing but because I can just see your proud face now! that is super terrific and I know those marks are very meaningful. CONGRATS FRACK! It’s weird to be proud of no choking. You never imagine in your wildest dreams that this will be a goal you have for your five year old. You assume that it is a given to not choke others. Apparently, it is not.